The Kustom Shop is a family owned Auto Collision Facility located on the west side of Lincoln. Our goal is to provide high quality repairs on a timely basis. We work with all insurance companies and handle your claim from start to finish so you don't have to. We also specializes in vehicle accessories from wheel flares to lift-kits and love working with all makes and models. New ownership starting July 2016 is taking us to new and exciting places with superior customer service. Lincoln's Friendliest Body Shop - We Make Friends By Accident! This what your The Kustom Shop Lincoln Ne Blog Ad will look like to visitors! Of course you will want to use keywords and ad targeting to get the most out of your ad campaign! So purchase an ad space today before there all gone! Busy time here at The Kustom Shop – Auto Collision and Accessories! We always tend to get the fun Jeep projects up on facebook, but here’s the time where I show you the rest of what we’re doing. Auto Collision, that’s our #1 bread and butter. And we’ve got a lot of it going today. The statements don’t mean much by themselves; a long, ruthless road separates a carmaker’s war room from the dealer’s showroom, littered with ideas killed during the march from the former to the latter. The hybrid pickup idea has been a wily survivor at Toyota HQ, though. Remember the Toyota A-BAT concept hybrid pickup from 2008? The A-BAT went from imminent arrival to indefinite hold in a year (and with it died Toyota’s plans for a small-displacement diesel). In 2011, Toyota announced a collaboration with Ford to bring a hybrid pickup to market. Less than two years later, the tie-up had gifted the world little more than an acrimony, a public break-up, and assurances that both automakers would keep production hybrid pickups on their big boards. Battery-assisted haulers are on the way. In January, Ford announced plans for a showroom-ready F-150 hybrid by 2020. Behind-the-scenes types posit the arrival of a next-gen Jeep Wrangler hybrid pickup and a mild hybrid in the Ram lineup. Third-party fleet specialists like Workhorse and XLP plan to sell retrofitted hybrid pickups next year, a development certain to massage consumer hearts and minds; Bob-Lutz-approved VIA Motors expects to move 50,000 such vehicles by itself. Having mulled the idea for so long, and with so much imminent movement in the segment, and with a Toyota hybrid already doing righteous work in the Lexus NX 300h – which weighs about the same as a Tacoma – we don’t envision Toyota staying out of the game for long. Hyundai has just crossed a significant milestone in its history. Since the company’s introduction to the American market back in 1986, the company has now sold 3 million cars here. The three millionth is a new Elantra sedan, a handsome, competent car that we don’t find to be terribly exciting unless it’s the Sports model with the turbo engine. But we’re certain the owners of this new Elantra are pretty excited regardless. See, Hyundai didn’t exactly sell the 3 millionth American Hyundai. It donated it to Henry Rogers, a paramedic field supervisor in Baytown, Texas, near Houston. His town was pummeled by Hurricane Harvey, and he was out helping people for two days straight. Unfortunately, while he was out helping the citizens of Baytown, his family’s home was being swallowed up by water. Neighbors came by to rescue his wife, three adopted kids, and three dogs. Everyone came out all right, but the house and its contents were lost. 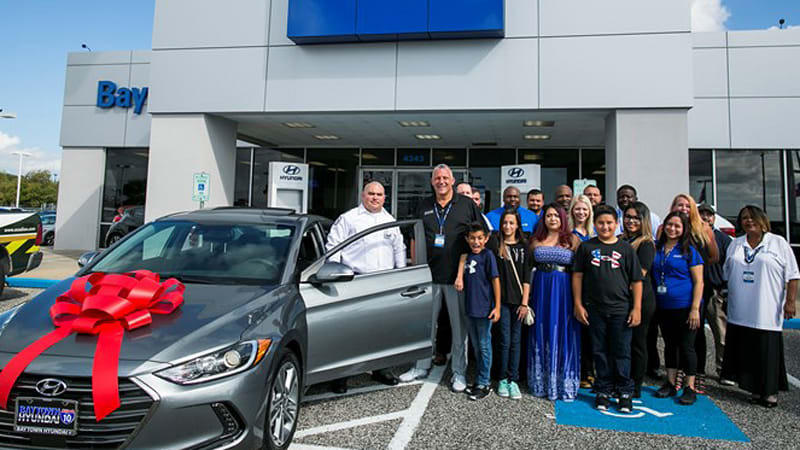 So for Rogers’ contribution to the town, and for everything his family lost, Hyundai saw fit to get them started on the right foot with a fresh car, and a fairly historic one no less. The Kustom Shop Lincoln Nebraska – Tin Foil Cat’s are smart! 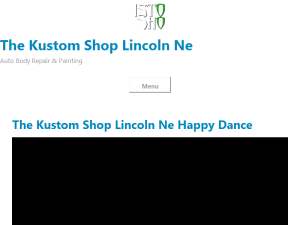 If you are the owner of The Kustom Shop Lincoln Ne, or someone who enjoys this blog why not upgrade it to a Featured Listing or Permanent Listing?